The first manned lunar landing on the 20th of July, 1969 was the greatest, most dramatic scientific achievement in human history. Neil Armstrong stepped onto the moon’s surface at 02:56 GMT on the 21st of July. 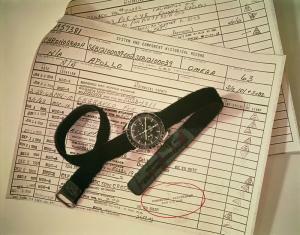 Nineteen minutes later he was joined by Buzz Aldrin, who was wearing his OMEGA Speedmaster and a legend was born. An interesting footnote: the electronic timing system on the Lunar Module was not functioning correctly so Armstrong had left his watch aboard as a reliable backup. Two OMEGA Speedmaster Professional Moonwatch Apollo 11 “40th Anniversary” Limited Edition watches celebrate the adventure: one in stainless steel and sterling silver (7,969 pieces); the other in platinum and 18 Ct yellow gold (69 pieces). The distinctive timepieces are powered by OMEGA’s calibre 1861, which shares its lineage with the calibre 321 used in the original Speedmaster Professional Moonwatch. The stainless steel casebody is delivered with a stainless steel bracelet which has been upgraded to include OMEGA’s patented screw and pin system. The black dial also recalls that of the Moon Watch but has some key differences. The small seconds counter (sub-dial) is a medallion which features an adaptation of Apollo 11’s famous mission patch: an eagle descends to the lunar surface with an olive branch representing peace in its claws. In the distance, far above the horizon, the earth is visible. The patch, interestingly, was designed by Michael Collins who remained in the Apollo 11 capsule as Command Module Pilot while his colleagues Armstrong and Aldrin were in the Lunar Module and on the moon. The watch’s hour, minute and the red-tipped chronograph seconds hands are coated with Super-LumiNova. The minute and hour chronograph counter hands are white and there is a brushed, rhodium-plated small seconds hand in attractive relief to the slightly recessed medallion on the counter. The 40th Anniversary Limited Edition’s dial is protected by Hesalite, the same robust, shatter-proof acrylic crystal found on the original Moon Watch. Hesalite is ideally suited for use in space – there is no chance that it can break apart and send potentially dangerous fragments into the low-gravity environment. A small, distinctive OMEGA logo has been etched evocatively inside the Hesalite crystal. 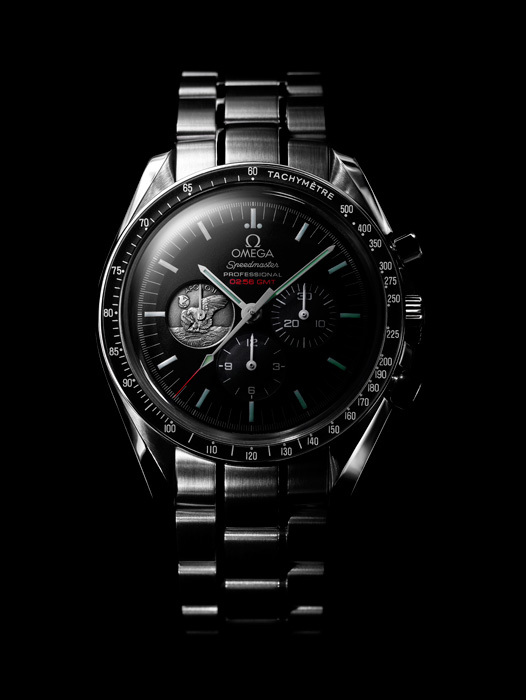 The OMEGA Speedmaster Professional Moonwatch Apollo 11 “40th Anniversary” Limited Edition is delivered in a black presentation box which also includes a 42 mm sterling silver medal (the same diameter as the watch) featuring an engraving of the mission patch on one side with the words “APOLLO 11, 40th ANNIVERSARY”. On the reverse side, the medal is engraved, “THE EAGLE HAS LANDED”; “LAUNCHED JULY 16 1969”; “LANDED JULY 20, 1969”; and “RETURNED, JULY 24, 1969” along with OMEGA’s name and logo. Also in the presentation box is a certificate of authenticity and an envelope containing a black polishing cloth printed with information commemorating the historic space flight. A platinum version of the OMEGA Speedmaster Professional Moonwatch Apollo 11 “40th Anniversary” watch is also being released in an edition limited to 69 pieces. The casebody and screw and pin bracelet are made of platinum and the medallion on the small seconds counter is made of 18 Ct yellow gold as is the small seconds hand. The hour and minute hands as well as the 30 minute and 12 hour counter hands are made of platinum. This elegant version of the watch is also delivered with a 42 mm 18 Ct yellow gold medal, in a limited and numbered edition, with the mission patch engraved on one side along with the words “APOLLO 11, 40th ANNIVERSARY”. As with the sterling silver medal included with the stainless steel watch, the reverse side features the engraved legend: “THE EAGLE HAS LANDED”; “LAUNCHED JULY 16 1969”; “LANDED JULY 20, 1969”; and “RETURNED, JULY 24, 1969” along with OMEGA’s name and logo. The caseback features the mission patch in 18 Ct gold with the words “Apollo 11 40th Anniversary”. Around the platinum outer ring of the caseback appear the words, “The first Watch Worn on the Moon”, “PT950” – a reference to the watch’s platinum content, and “July 21, 1969”, the date that Neil Armstrong and Buzz Aldrin stepped onto the lunar surface. 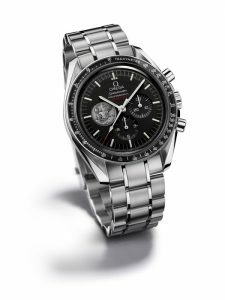 Like the stainless steel watch, the platinum version of the Speedmaster Professional Moonwatch Apollo 11 “40th Anniversary” features the shatterproof Hesalite crystal and the OMEGA calibre 1861 movement. A subtle reminder on the small medallion on the dial indicates just how special this watch is: the limited edition number (00/69) is engraved at the base of the small mission patch on the dial. The platinum Speedmaster Professional Moonwatch Apollo 11 “40th Anniversary” Limited Edition are delivered in a striking wooden case with elegant ornamental marquetry. The limited edition number (00/69) is embossed on the top cover of the case along with the Apollo 11 mission patch. The steel feet are engraved with “1969”, the year the Apollo 11 mission took place and “2009”, the year the world commemorated its 40th anniversary and the year the watch was produced. The case also includes a certificate of authenticity. These exquisite timepieces will initially be available exclusively at the OMEGA Boutique on Fifth Avenue in New York City when it opens later this year.